One of my friends was great enough to let me know the Glyph awards had gone live! 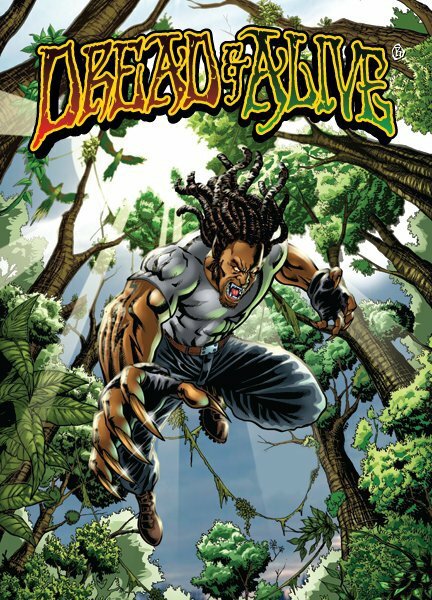 And et this one of my favorite independent comics “Dread & Alive” by Nicholas Da Silva has been nominated in the Rising Star category 🙂 congratulations to all the nominees and congrats to Dread and Alive! UNKNOWN SOLDIER led the 2011 Glyph Award nominations, with six nods. The awards are presented each year to “the best in comics made by, for, and about people of color from the preceding calendar year.” The nominations are picked by a judging panel which this year consisted of Jennifer Contino, Martha Cornog, Joseph Phillip Illidge, J. Caleb Mozzocco, and Chad Nevett. For the first timein 2011, a special Chairman’s Award will presented to a non-comics work which “illuminates the black comics experience in an exceptional manner, and also broadens and deepens the growing body of knowledge about black comics worldwide.” This year it will be presented to Black Comix: African American Independent Comics Art and Culture, by Damian Duffy & John Jennings. The poll for the Fan Award will go up next month at the ECBACC website (www.ecbacc.com/wordpress). Fans are encouraged to vote for their favorite black comics from the five nominees listed, or to submit their own with a write-in choice. All write-in ballots must be sent to rich.watson@gmail.com with “Fan Award” in the subject line. IMPORTANT: The write-in ballot is ONLY for choices NOT listed on the poll. ANY WRITE-IN BALLOTS WITH ANY OF THE FIVE NOMINEES ALREADY ON THE POLL WILL BE DISCARDED AND WILL NOT COUNT. In addition, for the first time, the GCA Committee announces the creation of the Chairman’s Award, a new award given in special recognition of a work in any media outside of comics, including but not limited to books, television, film, or the Internet, that illuminates the black comics experience in an exceptional manner, and also broadens and deepens the growing body of knowledge about black comics worldwide. This year, the GCA Committee bestows the award to the book Black Comix: African American Independent Comics Art and Culture, by Damian Duffy & John Jennings, a reference book spotlighting over fifty different independent black comics creators from the past quarter century. The release of this book was accompanied by a gallery exhibition in New York containing artwork from some of the book’s featured artists. The GCA ceremony will be held May 20, 2011, in the Skyline Room of the Free Library of Philadelphia, Park Central branch, as part of ECBACC, which will take place at the Crown Plaza Hotel Center City, in Philadelphia, PA, May 21, 2011. The awards were founded in 2005 by Rich Watson as a means to provide news and commentary of comics with black themes, as well as tangential topics in the fields of black science-fiction/fantasy and animation.